At Better Built Barns, we want every customer to be pleased with their new shed or garage. Read below for installation requirement info and answers to general questions regarding our buildings. Two feet of clearance around and above the entire building for construction. Site needs to be within six inches of level and free of obstruction or debris (including pet debris). We need to park our truck and use a power outlet within 120 feet of the building location. If you are putting gravel down, we recommend three to four inches of 3/4-minus gravel. If you do not have a concrete slab foundation, a block charge will apply. (The blocks are placed under the 4″x4″ skids and are used to level out the base of your building). Better Built Barns employees DO NOT EXCAVATE! The installation date is scheduled by Better Built Barns. Lead time is two to four weeks and may be extended during busy seasons. The customer is contacted for confirmation a few days before installation and on the morning of the install date. Builders should arrive at the customer’s site for install between 9:00 – 10:30 AM on the scheduled date. Better Built Barns will not send out a crew if we have not been able to make contact with the customer to confirm delivery. If inclement weather prevents delivery, arrangements will be made with the customer for the next available date. If the customer needs to reschedule, they should call the store where the building was purchased at least five days before their scheduled date. Caulking and painting must be done within 90 days of construction. Doors must be painted on both sides and all four edges. All horizontal, vertical, and diagonal trim should be caulked. Caulking and painting are not included, and are the responsibility of the customer. Checking with the local authorities to determine if a building permit is required and pay any associated costs. Checking with their zoning authorities for building restrictions, neighborhood association CC&R’S, and reviewing his/her deed or private contractual arrangements for any additional restrictions. Refunds will be processed by the merchant where the order was purchased. Payments made via credit card may be subject to a 2 percent processing fee when refunded. Refunds may take up to 30 days for processing. How long does it take until I can have my building installed? How long does it take to construct the building? What do I need to do to prepare the site? I have an existing slab, can you build the shed on that? Is the building a kit? What is included on a standard building? How is the building constructed? Can I customize the building? Do you offer larger or custom buildings? Do you subcontract your installations? 1. How long does it take until I can have my building installed? Our lead time is typically two to four weeks, depending on the time of year. 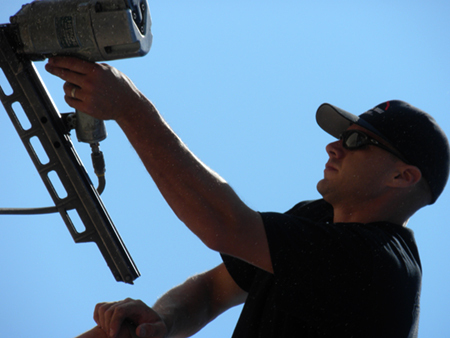 Late summer and early fall are our busiest times of the year, and will tend to be when we have the longest lead times. 2. How long does it take to construct the building? Our goal is to have your building constructed within one day. On a smaller shed, it should take three to four hours, and larger, more complicated buildings may take up to eight hours. Occasionally, we are not able to finish in one day and schedule to return to finish the building the next day, but rarely have to come back a third time. Our buildings are pre-cut, which makes the construction process very quick and simple for our installers. 3. What do I need to do to prepare the site? We require that the site be cleared and level within six inches, and that we have at least two feet of clearance around the building with three feet above it. We also ask that you stake out the corners of the building and where you would like the center of the door(s). We need electricity within 120 feet, but can provide a generator for power for a fee. 4. Do I need to be home during the installation? It is not necessary to be present during every stage of the installation. However, we do ask that someone be present initially to show the installers where to place the building, as well as upon completion. When we are finished installing your building, we do a walk-through of the building with our customer, accept the final payment and sign the final completion paperwork. 5. I have an existing slab, can you build the shed on that? The majority of our buildings are built using our standard floor system, which is designed and manufactured to last, no matter the application. We are able to construct your building on an existing slab if it is square, level and of the exact dimensions of the shed you are ordering. If you would like to have your building constructed on a slab, please contact us to determine if your slab will meet our specifications. Due to the additional labor and specialty materials needed when installing on a slab, there is not any applicable discount or reduction in price. 6. Is the building a kit? No, we do not offer any Do-It-Yourself products at this time. All of our buildings are handcrafted on your lot or pre-built and delivered to your site. 7. What is included on a standard building? The standard building includes the basic structure itself (floor, walls, and roof) and also our standard 41″ wide wood door. There are no additional accessories included in the base building price, but you can order more options to customize your building at an additional cost. Caulking and Painting is not included, however the building will come primed and ready for paint. 8. How is the building constructed? 9. Can I customize the building? Yes, our buildings start as a very basic structure meant for customization and design by our customers. We offer a wide variety of options and accessories to tailor the building to fit your exact needs. 10. Do I need a permit? It is the customer’s responsibility to contact the local building department or homeowners association to find out their building code concerning the installation of an outbuilding. If schematics or drawings are required for submission, we are happy to provide these to you if needed; however, it is a case-by-case basis whether or not there are fees associated with this service. 11. Do you offer larger or custom buildings? Yes, we build outbuildings as large as 24’x30’ for uses of all kinds. 12. Do you offer painting? No, unfortunately we do not offer painting at this time, however our buildings do come primed and ready for paint. Be sure to check with the local sales office where you are purchasing to see if we might have a sub-contractor that we can recommend to you for the paint. We offer the best warranty around (10 total years) on the Better Built Sheds, so you can have peace of mind. Additionally, the Ready Built sheds have a 5 year warranty. 14. How do I order? Typically our customers call or email us with their information and get an estimate on the exact building that they want. They will then move forward with the order by placing a half-down deposit and either schedule an installation date or have the order put on hold until the site is ready. The final payment is due after the installation is complete. 15. What are the payment options? We accept Visa, MasterCard, Discover, check, or cash, and have financing available on approved credit. 16. Who will install my shed? Having someone in your backyard that you can trust is very important. All of our installers have passed a background check and completed our training program before they ever step foot on a site. Because they are a part of our team, they have a vested interest in the company and the product that we are producing. Additionally, Better Built Barns, Inc. is a licensed, bonded, and insured corporation. Contact us today to get started on your custom shed or garage!